When I buy tofu I usually only use it one way: I fry it in the saucepan and add it to my vegetarian super salads that I usually have for lunch. But I was very happy to use it another way. Here a few things about tofu. One is that when you buy tofu, it can be either soft or firm (this one will suit better this recipe). The second thing you need to keep in mind, is that you will need to dry your tofu before you cook it (cover with salt and pat it down with kitchen paper). I am really into oriental and sweet and spicy ingredients, so if you feel the same way, this recipe is for you! When I read it at an English blog I couldnt resist to start the ingredient hunt and cook that same afternoon. The ingredients as well are not too difficult to find, its quite inexpensive, easy, savoury and perfect meal to surprise guests! – Sesame Seeds, the more, the better! First toast sesame seeds in a pan with no oil (keep it moving so they dont burn). Place into bowl. 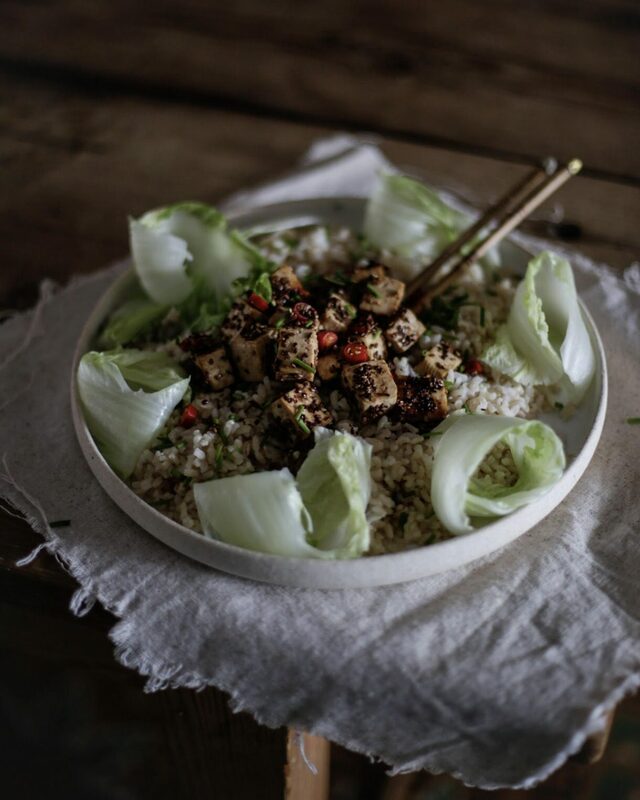 After drying your tofu into a firm base, you can cut it into cubes and add honey, grated ginger, soy sauce and one chopped chilli (the more, the merrier!). Leave tofu marinating in a bowl for 10 minutes. After that, you can put the tofu into a plate with the sesame seeds so these get stuck to all the cube sides! Then heat a griddle pan and add the tofu cubes and meanwhile you can boil the rice in boiling water. Steam for about 3-5 minute the pak choi stalks. Then put the rice in a serving dish, add the pak choy, the 4 chopped spring onions, 1 red chilli and a splash of soy sauce and lastly put the sticky sesame toasted tofu on top of it and make sure you dont forget to add all the sticky tofu juices!